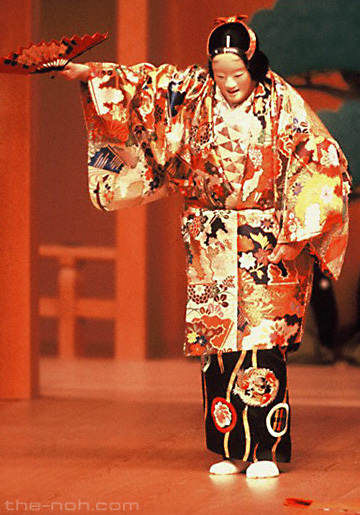 The costumes used in noh are called noh shōzoku. 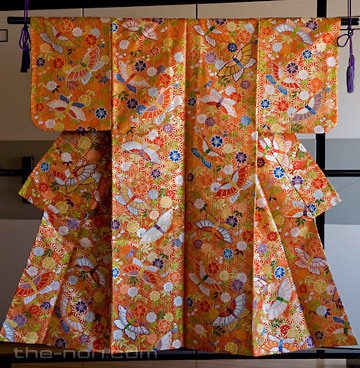 A good example is the karaori, an exquisitely embroidered, traditional woman’s kimono. Certainly one of the most beautiful theatrical costumes in the world. During the early stages of noh, around the time of Kannami and Zeami, the costumes were more modest, as they were using the their everyday clothes to perform in. However, as noh became favorable in the eyes of the aristocracy and military ruling classes, they began to receive more finely crafted kimono to perform and this gradually became the norm. Furthermore during the Azuchi Momoyama period (approx. 1558-1600), the flourishing of Japanese culture coupled with great advances in fine arts led to even higher standards for costumes. In this way, these costumes were truly works of art and quite separated from reality of the character. For example, historically, a poor fisherman or a woman who gathers sea-salt would not be adorned in such finery, but by using such stylized and symbolic costumes, noh is better able to express a characters feelings. Kaburi-mono (things worn on the head): eboshi (hat), tengan (headdress), etc. Uwagi (various outer garments worn over kimono): nōshi (imperial robe), kariginu (hunting cloak), happi (festival coat), chōken (outer shawl), maiginu (dancing shawl), etc. Kitsuke (short sleeved kimono worn under outer kimono): surihaku, nuihaku, noshime, etc. Uwagi / Kitsuke (outer kimono): karaori (exquisite women’s kimono), atsuita (exquisite male kimono), etc. Hakama (Japanese pleated loose-fitting trousers): ōkuchi (large warrior hakama), hangiri (lit. half-cut hakama), sashinuki, nagabakama (lit. long hakama), etc. Other small items like sashes used for tying things on: kazura-obi, koshi-obi, koshi-himo, etc. A karaori, is a fine example of an exquisite outer kimono used in noh to portray women characters. Karaori means “Chinese style fabric” as it is said to be modeled after the Chinese Shokko brocade of the Ming period. This is a short sleeved kimono made using the uki weaving technique employing gold, silver and other colored thread create gorgeous flower patterns. When a female character is introduced in noh and she is wearing a karaori, it is often times worn in a style called kinagashi. In this style, the upper part is folded in such a way as to leave the neck open (for better viewing of under kimono) and the lower part is adjusted at the hem to create a triangular shape around the legs which gives the impression of refinement. While noh costumes do not “realistically” represent the characters they are portraying, the costumes can tell the audience a lot about the character. As there are a number of set rules in noh regarding combinations of costume pieces, if one knows enough about these combinations, one can accurately tell the gender, age, social status, occupation and personality of that character. A simple example of this is the notion of “color” in a noh costume. In female costumes, if there is red in the costume it is said to be iroiri (lit. red in), if there is not, it is called ironashi (lit. red nothing). Young women wear iroiri costumes, middle aged and older wear ironashi. The red that appears may not necessarily only appear in the outer kimono, but also in the sashes used to fasten the wig and/or the kimono to the performer. Another example of indicating character through costume would be through the use of the collar. The eri (collar) can be any number of colors including: white, light blue, red, yellow/gold, dark blue or brown. Choosing how to arrange these color’s around the neck gives the audience an idea of the character’s social status or inner feelings. As white is the color of purity in noh, if a character is wearing two layers of white collars, this would indicate their being of the highest level of purity or top. It is ultimately the decision of the shite as to what costume they would like to wear on stage. So while there are rules that need to be followed, the shite still has great room for personal expression in choosing the combination of shōzoku for a noh. Please take a look at an interview with costume maker Yamaguchi Yasujiro.